8 small cottages all in a row, workers? ..but not completely alone because this house was around in 1905 as well. Apparently in the ARP as a building of interest, but very modified appearance since the ARP was written. Visiting a friend in my old neighbourhood this summer I noticed an interesting exposure next door to him. Corner of 32 Ave and 1st street N.E. Anyone know how old this building would be? That's really interesting, from the exposed surface it appears that it may have originally had a false front displaying the full "General Merchant", but was then cropped to form a more regular front and converted into a home. My Property lists it as being built in 1911, but what's interesting is in a 1924 aerial photo that entire section of the block is vacant. To me this can only mean that sometime after 1924 that house was moved from somewhere else, perhaps where it was being used as a store, to the current location. The person [ a mr. Pinner] that owned your house [#137] from 1920 until 1925 or so bought the lot next door [#141] and built a general store around 1927 at which time he is no longer the owner of your house. He operates #141 as a store until it is later sold to a " a mr. Jacques" who also operates it as a grocery store. Your house [#137] goes back to 1913. My old house 134 31st ave goes back to about 1933 only. I wonder why my year info would differ from yours, what is your source? My source is the city of calgary's My Property online property info database. Personally I would believe Henderson's over My Property, unless the part about him building a store was actually him moving it there from elsewhere. Also the fact it was built in 1927 lines up with no building being there in the 1924 photo. 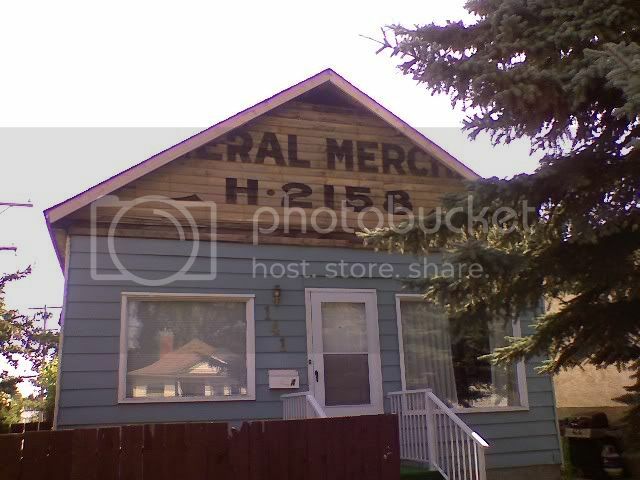 Hi Chris, as I mentioned, House #137 next door [my friends] has been there since 1913. I suppose someone may have moved the subject building there in the late 20's.